Has a glowing dragon curled around Las Vegas in the night in this third installment of Grant’s Millennium Quartet, which features the Four Horsemen of the Apocalypse as its framing device? In the lackluster opening volume, Symphony (1996), the pale horseman Death descended on the town of Maple Landing and created a host of bizarre effects. In In the Mood (1998), the horseman Famine attacks New Orleans and mass murderers were loosed upon the world. Now the horseman Plague has attacked the world, with only Las Vegas mysteriously free of the super-virulent smallpox mutation killing millions. Outside of Vegas rests the abandoned village of Emerald City, where drifter Travis Falkirk lives for the moment and protects the little sisters Moonbow and Starshine and their mother, Jude. 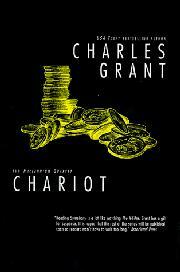 Travis has a beautifully black-painted and polished old pickup truck he calls Chariot, with which—aided by angels—he will right the dragon. Travis also has a magic touch that lets him best slot machines and cover his expenses. As it happens, Las Vegas is off-limits to the plague because the horseman waits there for Travis. Grant’s thought behind this quartet is that the turn of the millennium sponsors weird and paranormal events that emerge from the dark side of man’s nature. If these events were of a more Jungian and archetypal nature, and less a sandstorm of melodrama, they might be more effective. As is, they feel merely hacked out. Many readers will recall Stephen King’s superflu in The Stand, a novel that also came to focus on a supernaturally evil figure in Las Vegas.